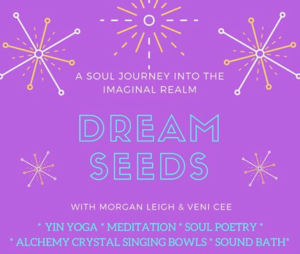 Creating space through gentle, intentional movement and meditation to ignite the spark of inspiration as we allow our imagination to enter into a dream state of inner wisdom. Be bathed in a cocoon of words and sounds, to tune you into what is wanting to take shape in the depths of your soul at this time. *Yoga mats, blankets and cushions provided to you for maximum coziness, or bring your own if you like!